Our girls tank style dresses run very true to size. We do NOT suggest upsizing without discussing sizing with us. These are drop waist dresses and if you upsize when its not needed, the waistline can hang below the childs bottom. Please contact us with any questions or concerns BEFORE purchase. beautiful dress. well made. true to size. came fast. grand daughter is excited to wear it this summer at Disneyland. Awesome dress!! It was the highlight of my 3 year old granddaughter's Spider-Man birthday party along with the main man showing up!! Communications were speedy & helpful and shipping was a step above & beyond! Thx for helping me out on such short notice! Top notch service! The dress was sent in great time and looks great, party is today. I know she will love it. My granddaughter wore the dress and it fit great. She had the biggest smile on her face and was shooting her spiderweb. You all did a wonderful job. She will be able to wear it a long time. 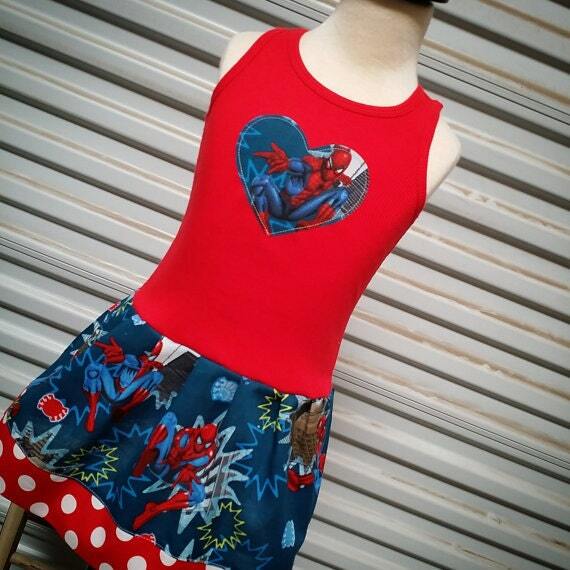 If anyone needs a Spiderman dress get this one.